Neptun Aquapark in Ravadinovo 5 km. from Sozopol, offers its visitors a real adventure and a unique space for Bulgaria. The numerous water slides and the largest and safest children’s Prater in the country are located on 50,000 square meters. among green areas and extensive spaces with eating facilities, bars, relaxation areas and additional services. 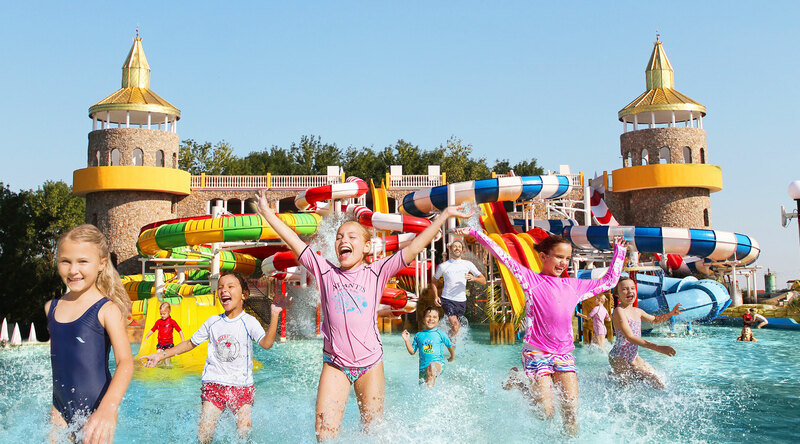 On the territory of Aquapark Neptune, you will find everything you need for a perfect day filled with fun for the whole family. Our numerous rescuers, friendly staff and protected children’s water slides guarantee the safety of your children and give you the opportunity to enjoy a complete relaxation with a cocktail in hand. Situated next to the Aqua park is the emblematic castle “In love with the wind” in Ravadinovo, a wonderful opportunity to combine water entertainment and immersion in the fairy tale kingdom. With its attractive offers and price conditions, Neptun Aquapark offers its guests an exceptional price-quality ratio! Седем пързалки – екстремно изживяване! Осем пързалки – удоволствие за малки и големи! The park offers many extra services and entertainment for all ages!